(Francisco Kjolseth | The Salt Lake Tribune) A tray from the 2nd Mesa Hopi tribe shows the intricate detail in craftsmanship as the anthropology collections staff from the Natural History Museum of Utah show off and discuss several newly acquired cultural artifacts collected by John Wesley Powell, well known in Utah for his famed Colorado River expeditions in1869 and during 1871-1872. The artifacts will be displayed during a public event at the museum Saturday, Sept. 22, for one day only due to the delicate nature of the items. (Francisco Kjolseth | The Salt Lake Tribune) Anthropology collections staff from the Natural History Museum of Utah show off and discuss several newly acquired cultural artifacts collected by John Wesley Powell, well known in Utah for his famed Colorado River expeditions in1869 and during 1871-1872. 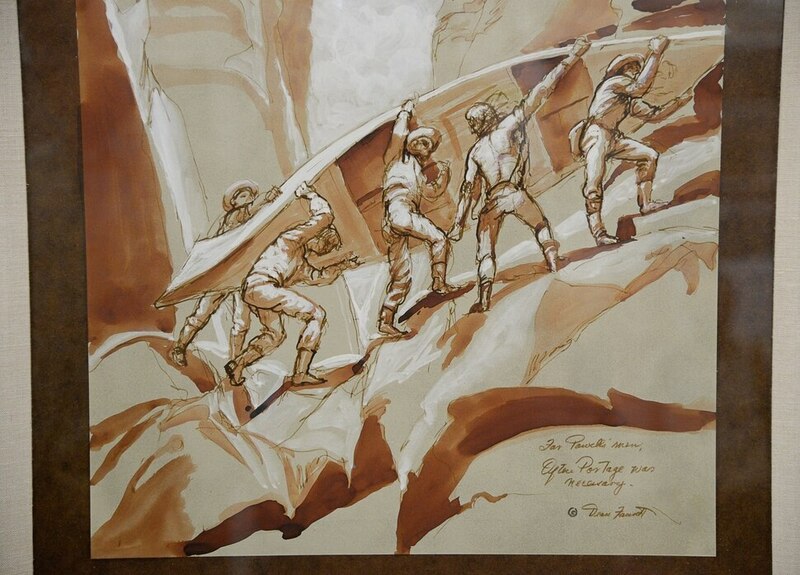 Included are several original sepia water color and ink drawings by noted American painter and Utah artist Dean Fausett who illustrated the Powell expeditions. (Francisco Kjolseth | The Salt Lake Tribune) John Wesley Powell experts and distinguished anthropologists Catherine Sweeney Fowler and Don D. Fowler from the University of Nevada, Reno talk about recently acquired artifacts by the Natural History Museum of Utah collected by explorer Powell during his famed Colorado River expeditions. (Francisco Kjolseth | The Salt Lake Tribune) Numerous new cultural artifacts are now part of the collections department at the Natural History Museum of Utah. Originally collected by famed explorer John Wesley Powell were recently discovered at Illinois State University by University of Utah Geology and Geophysics Professor Marjorie Chan who brought them to Utah. The artifacts will be displayed during a public event at the museum Saturday, Sept. 22, for one day only due to the delicate nature of the items. (Francisco Kjolseth | The Salt Lake Tribune) Anthropology collections staff from the Natural History Museum of Utah show off and discuss several newly acquired cultural artifacts collected by John Wesley Powell, well known in Utah for his famed Colorado River expeditions in1869 and during 1871-1872. Included are several original sepia water color and ink drawings by noted American painter and Utah artist Dean Fausett who illustrated the Powell expeditions. (Francisco Kjolseth | The Salt Lake Tribune) Glenna Nielsen-Grimm, an anthropologist with collections and research at the Natural History Museum of Utah, left, and anthropologist Catherine Sweeney Fowler from the University of Nevada, Reno inspect the coiling weave structure of a well used Ute tribe basket that was collected by John Wesley Powell, well known in Utah for his famed Colorado River expeditions in1869 and during 1871-1872. The artifacts will be displayed during a public event at the museum Saturday, Sept. 22, for one day only due to the delicate nature of the items. (Francisco Kjolseth | The Salt Lake Tribune) University of Utah Geology and Geophysics Professor Marjorie Chan, Glenna Nielsen-Grimm, an anthropologist with collections and research at the Natural History Museum of Utah and anthropologist Catherine Sweeney Fowler from the University of Nevada, Reno, from left, inspect Ute tribe bow and quiver that was collected by John Wesley Powell, well known in Utah for his famed Colorado River expeditions in1869 and during 1871-1872. The artifacts will be displayed during a public event at the museum Saturday, Sept. 22, for one day only due to the delicate nature of the items. (Francisco Kjolseth | The Salt Lake Tribune) Anthropology collections staff from the Natural History Museum of Utah show off and discuss several newly acquired cultural artifacts collected by John Wesley Powell, well known in Utah for his famed Colorado River expeditions in1869 and during 1871-1872. Included are several original sepia water color and ink drawings by noted American painter and Utah artist Dean Fausett who illustrated the Powell expeditions. (Francisco Kjolseth | The Salt Lake Tribune) University of Utah Geology and Geophysics Professor Marjorie Chan talks about how she came in contact with several newly acquired cultural artifacts collected by John Wesley Powell, well known in Utah for his famed Colorado River expeditions in 1869 and during 1871-1872. At right are Powell experts and distinguished anthropologists Don D. Fowler and Catherine Sweeney Fowler from the University of Nevada, Reno. (Francisco Kjolseth | The Salt Lake Tribune) A pair of moccasins believed to be Navajo or Apache are now part of the collections at the Natural History Museum of Utah. Many new cultural artifacts collected by famed explorer John Wesley Powell were discovered at Illinois State University by University of Utah Geology and Geophysics Professor Marjorie Chan who brought them to Utah recently. The artifacts will be displayed during a public event at the museum Saturday, Sept. 22, for one day only due to the delicate nature of the items. (Francisco Kjolseth | The Salt Lake Tribune) University of Utah Geology and Geophysics Professor Marjorie Chan, Glenna Nielsen-Grimm, an anthropologist with collections and research at the Natural History Museum of Utah and anthropologist Catherine Sweeney Fowler from the University of Nevada, Reno, from left, inspect Ute tribe bow and quiver that was collected by John Wesley Powell, well known in Utah for his famed Colorado River expeditions in1869 and during 1871-1872. The artifacts will be displayed during a public event at the museum Saturday, Sept. 22, for one day only due to the delicate nature of the items. (Francisco Kjolseth | The Salt Lake Tribune) Glenna Nielsen-Grimm, an anthropologist with collections and research at the Natural History Museum of Utah discusses several newly acquired cultural artifacts collected by famed explorer John Westley Powell, well known in Utah for his famed Colorado River expeditions in1869 and during 1871-1872. The artifacts will be displayed during a public event at the museum Saturday, Sept. 22, for one day only due to the delicate nature of the items. (Francisco Kjolseth | The Salt Lake Tribune) Anthropology collections staff from the Natural History Museum of Utah show off and discuss several newly acquired cultural artifacts collected by John Wesley Powell, well known in Utah for his famed Colorado River expeditions in1869 and during 1871-1872. Included are several original sepia water color and ink drawings by noted American painter and Utah artist Dean Fausett who illustrated the Powell expeditions. 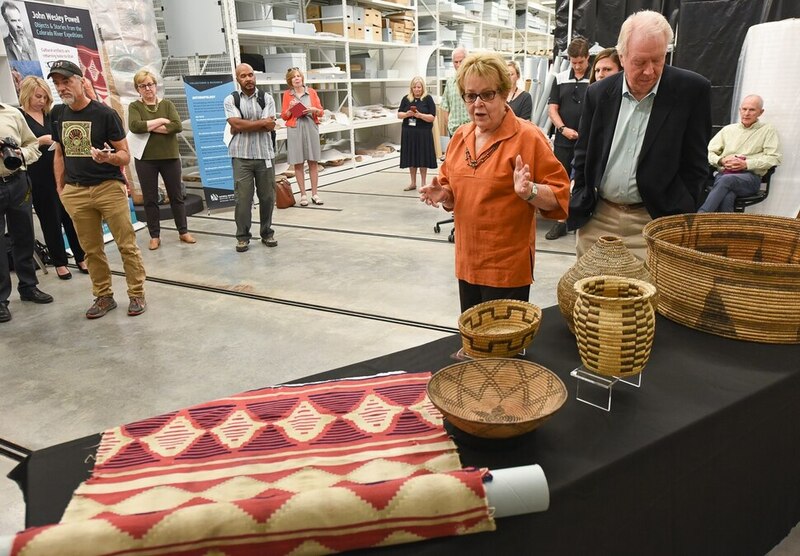 (Francisco Kjolseth | The Salt Lake Tribune) Lisbeth Louderback, curator of archeology at the Natural History Museum of Utah points out the unique qualities of a basket by the Tahono O'odom tribe that was collected by famed explorer John Westley Powell and recently added to the museum collection. Numerous artifacts will be displayed during a public event at the museum Saturday, Sept. 22, for one day only due to the delicate nature of the items. Earlier this year, University of Utah geology professor Marjorie Chan was giving a speech at Illinois State University when she told her host, Dave Malone, about her interest in Western Americana and her desire to visit area antique shops. Instead, Chan was shown the contents of a closet in the school’s geology building. Tucked inside were 150-year-old Native American baskets and apparel collected by the famed John Wesley Powell while exploring Utah. “They asked if I would be interested in seeing them. They had been storing them in a closet for 20 years,” Chan said Thursday at the Natural History Museum of Utah. She quickly began looking into how to get the objects to a museum. Now these items are back home, part of the Utah museum’s vast anthology collections. The museum will put them on display for a one-day event Sept. 22, along with lectures by three experts about Powell’s famous expeditions that helped inform 19th-century Americans about the remote arid lands of the Southwest and the indigenous people who lived there. In 1869 and again in 1871, Powell, a geologist and battle-scarred Civil War veteran, short one arm, led the first trips down the Colorado and Green rivers through Utah and Arizona’s Grand Canyon, exploring the West’s most inaccessible lands at a time when they remained blank spots on the map. After his journeys, he returned to Illinois and taught at the school that would become Illinois State, before moving to Washington, D.C., to head the U.S. Geological Survey and the Smithsonian’s Bureau of Ethnology. Among the materials he left in Bloomington — and that were shown to Chan — were beaded moccasins, baskets woven from grass and willow, a bow studded with metal tacks and strung with intact string made from sinew and an arrow quiver. “This pushes our ethnographic collection back in time to earlier historic periods. These are physical evidence that represent Powell’s expeditions and are therefore worthy of museum care,” said Lisbeth Louderback, a U. assistant professor of anthropology, noting some have not fared well through the years and need extensive restoration work. Museum staffers, for example, took a microscope to a fan-shaped winnowing basket and discovered sunflower seeds embedded its wicker latticework. 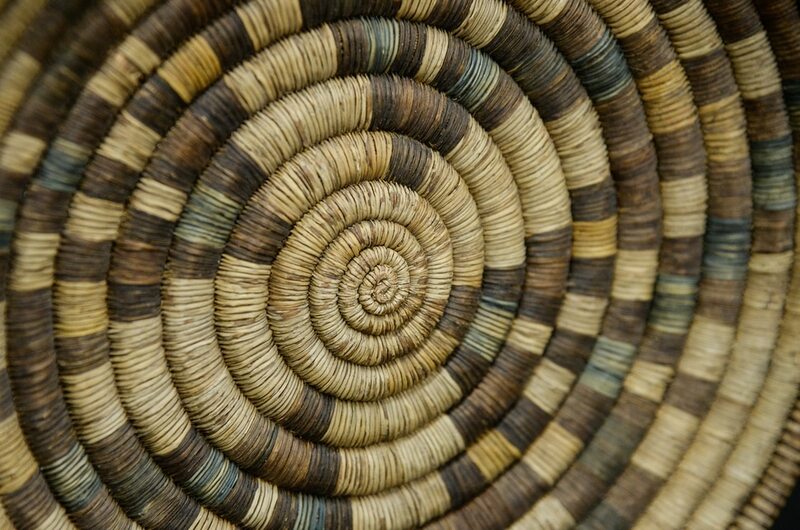 “Glenna [Nielsen-Grimm, the museum’s anthropology collections manager] was going through Powell’s journals and found some information that he observed Native Americans were processing sunflower seeds on trays like this,” Louderback said. Each item reveals something about how Utah’s indigenous people lived during the period of white settlement. Also to be exhibited are Native American artifacts collected by Frank Marion Bishop, who served as cartographer on Powell’s second expedition of 1871 and settled in southern Utah, and sepia watercolor paintings by Utah artist Dean Faucett, depicting Powell’s expeditions. Fausett painted the scenes a century later, relying on the explorer’s notes for inspiration. The items will be displayed in the museum’s collections area, so they don’t have to be moved out of the climate-controlled environment. The open house event will feature lectures throughout the afternoon by three Powell experts: Smithsonian researcher Fred Reuss; river runner Roy Webb; and Dave Malone, a geology professor at Illinois State. The event will go from 10 a.m. to 5 p.m., and admission is covered by the museum’s regular entrance fee. The exhibit offers a chance to learn about one of America’s greatest explorers, the namesake of Utah’s Lake Powell, and a historical figure who tried, mostly in vain, to educate federal officials about the natural obstacles to settling the West. Powell was a Union artillery commander. A Confederate musket ball took off his right arm at the elbow when he raised it to order his men to fire at Shiloh, according to Don Fowler, a University of Nevada, Reno, anthropology professor. Chan has an uncanny nose for museum-quality objects. In 2006, she came across a huge trove of rare Native American jewelry at a yard sale in Salt Lake City’s Sugar House neighborhood. The museum raised $180,000 to buy the 650 pieces for what became its Four Corners Collection. The day she came across the items from Powell’s Utah journeys was March 24, Powell’s birthday. She contacted the Smithsonian, the most logical destination, but she learned objects from Powell’s expeditions are spread around the world. So why not have some in Utah?